The SmartVision2 Premium version includes all the features of SmartVision2, but also includes voice-assisted car and pedestrian GPS navigation, optical character recognition and an e-book creator and reader. Enjoy voice-guided travels by foot or even help a driver navigate with the powerful Kapten GPS navigation app. Place your SmartVision2 Premium camera over reading materials, capture up to an entire 8.5×11” page and have it vocalized back to you. Enjoy reading with high-contrast and spoken text, and even create your own books. SmartVision Premium does it all! Smartphones too difficult to see or too confusing to use? SmartVision2 Premium could be for you. Customize your home screen for easy access to your favorite app, widgets and more! Create keypad shortcuts for speed dialing, accessing the accessibility menu, phone status information and more! Connect the unlocked phone with all GSM network operators such as Bell, Telus, Rogers for reliable phone service. Verify with your cell phone provider. 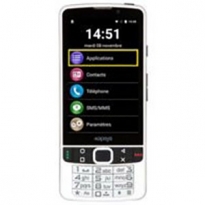 Easy 2-way communication makes the SmartVision2 the ideal phone for those who are deaf-blind. Use your braille display to type in braille, then send information through email, text message, skype and more! This simplified smartphone provides all of the functionality of a smartphone but in an easy-to-use device that is ideal for seniors. According to Google.ca - Is GSM used in Canada? All networks in Canada cuurently support one or more of GSM / AWS / UMTS / HSDPA / LTE . North American GSM uses 850/1900 MHz , UMTS/HSDPA 850/1900Mhz, LTE 1700/2600, AWS 1700/2100 frequencies. ... LTE from outside North America are not compatible but these phones usually have GSM/3G frequencies that are still compatible. (Feb. 02, 2019). Verify with your cell phone provider. Don’t need GPS navigation, bookreading or OCR/Scan&Read? SmartVision2 (standard version) removes these features to save you money if you don’t want to use them. If you’re not sure, SmartVision2 will include the Premium features for a 15-day trial. Try the GPS, OCR and Bookreader on your new SmartVision2. Upgrade to SmartVision2 during your trial and receive a discount off your upgrade.